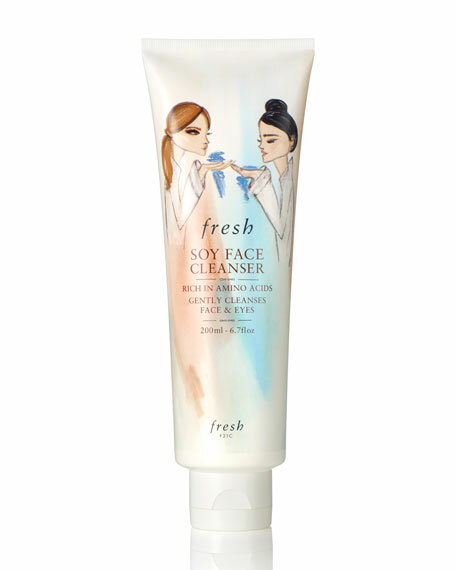 Fresh celebrates its skincare icon Soy Face Cleanser with limited-edition packaging in a special larger size. The design by artist Blair Breitenstein features a modern update of the original "Soy Girl" that adorned Soy Face Cleanser when it first launched in 2000. Now a cult classic worldwide, this extra-gentle gel cleanser for all skin types instantly whisks away everyday impurities and makeupeven mascarawithout stripping the skin of essential moisture. The multi-tasking formula features amino acid-rich soy proteins to help maintain skin elasticity and promote a healthy-looking complexion, calming rosewater, soothing cucumber extract, and nourishing borage seed oil. For in-store inquiries, use sku #2456803.